I remember when I first heard about Kogi. I was on my self imposed hiatus from taco criticism and I would periodically check my blog email. About half of the emails had to do with Kogi . I didn’t know what Kogi was. I was out of the loop. 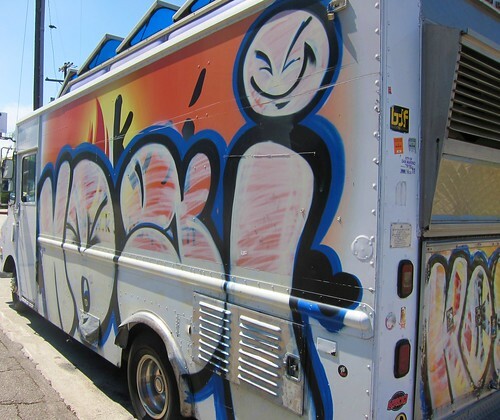 Then Kogi blew up and changed LA street food, started the whole gourmet truck scene, yada yada yada. But I still hadn’t tried Kogi. 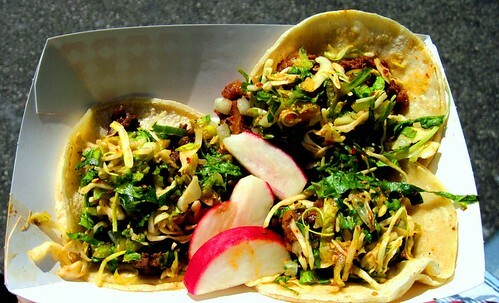 To me, a taco truck has always been about fast cheap food and the lines for Kogi were long and I’m lazy. Then one day I was pulling into the Best Buy on Pico Blvd in West LA and there was Kogi parked in the back of the parking lot. And no one was in line. Literally no one. I looked around and there were other people getting out of their cars and I knew they had the same idea as me. And we all walked towards Kogi rather slowly sort of like zombies and I knew what everyone was thinking because it was what I was thinking and we were thinking there‘s no one in line for these Cabbage Patch Dolls! I know whenever something becomes really popular there is a tendency to join the crowd or reflexively dismiss it as too trendy and not worthy of the hype. I’m somewhere in the middle. I loved these tacos, I think the Korean Mexican fusion taco is genius and it’s success can not only be seen in it’s devotees but also it’s imitators. But, I wouldn’t wait in line for an hour for one of these tacos. That’s not a criticism of the tacos it’s more of a criticism of those who have waited in lines, if reports are to be believed, for almost 3 hours! After that first bite of Kogi I started to keep an eye on them on twitter and whenever they were at the Brig I’d head down for short rib tacos. The short rib taco is one of LA’s best tacos. The sesame salsa roja, the tender beef short rib, the lettuce and cabbage slaw, it all comes together into this wondrous fulmination of taste and culture. 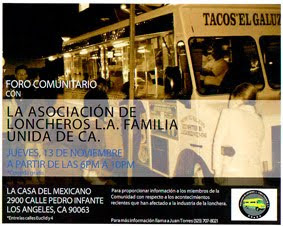 This is Los Angeles where taco wagon generators roar like lions into the end of the night and tacos shift from sidewalk planchas into the bellies of eager grease hounds. In this town Kogi has become as much LA as the taco truck parked in the lot of the tire shop, or the makeshift taco table in Glassell Park or Phillipe’s French Dip or Pink’s Hot Dogs or Tito’s Tacos. Welcome to the club Kogi, you’ve kicked down the door of the establishment, the city is yours, and like a ladybug that lands on your palm on a sunny afternoon it expects you to be gentle. And maybe old school taco hounds don’t want to admit it, but I will, because it’s pretty clear to this taco reporter that the Korean taco has conquered the city.